Makeup and beauty !!! 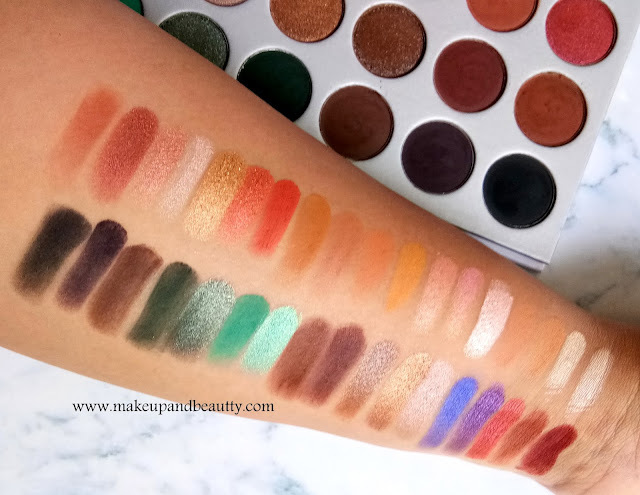 : REVIEW & SWATCHES OF MORPHE X JACLYN HILL EYESHADOW PALETTE. REVIEW & SWATCHES OF MORPHE X JACLYN HILL EYESHADOW PALETTE. Slowly and lately I have grown interested in collecting eyeshadow palettes so much that nowadays whenever I open my stash I can see many palettes just peeping up in my stash telling me that "when are you gonna review us?" 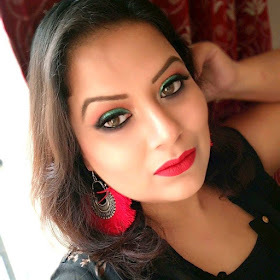 I am nowadays are more active on Youtube so I know my blog is being neglected for few months...So today I am up with a pure blog post after a pretty long time. Now MORPHE BRUSHES recently launched a palette along with collaboration with the famous YouTuber JACLYN HILL. The palette named as MORPHE X JACLYN HILL EYESHADOW PALETTE. Price:- $38 plus internal shipping charges. Instagram seller's price:- Rs.3800/- - Rs.5000/-. Availability:- Morphe Brushes website/ Instagram sellers (Nowandwowchennai, InternationalMakeup, Foreign_makeup). Enlight: An out-of-this-world, universal shade for brow bone and inner shadow magic. Beam: Amp things up with this frosted version of Enlight, it’s great for deeper skin tones. Silk Crème: Your transitional, creamy-matte crease color with yellow undertones. Faint: Love this princes's shade. No matter how fair skin you are, this fiercely frosty shade goes great all over the lid. Sissy: For the rose-gold queens out there, this super-girly shade was named after my sister. Little Lady: Confession: I call my sister ‘little lady’ and this is her second fave color. Perfect to rock at the office since it’s not too gold or out there. It’s the perfect shimmery wash of neutral. Creamsicle: OB-SESSED with this flattering yet daring color. Pop it into the crease to make the color of your eye’s pop. Butter: Super creamy with a warm, terracotta undertone makes this an amazing shade of your crease color. Pooter: For those of you not comfortable with super warm colors, this neutral chestnut shade, named after an inside family joke, is for you. Pukey: Yes, I named a color Pukey. My favorite matte color in the whole palette. SO creamy. SO pigmented. The ultimate warm brown. Hunts: Linda made this daring, boldly blendable shade happen. I love it because…it’s perfect. The creamiest shade in the palette. My fave shade of all-time. Firework: Dare I say this is the most shimmering shade? It’s great for all over the lid and for creating a warm, smoky eye. Partner it up with any of the matte orange shades. Queen: The perfect gold. I have nothing else to say. Obsessed: I was looking to create a shade for the perfect smoky eye. This took forever to get right, but it’s perfect and I’m total, you guessed it, Obsessed. S.B.N. : One of my most-used, all-over-lid colors is this deep, pinky-bronze shade. It creates the perfect, smoky but natural look. S.B.N…N.B.D. Hillster: God, I love this color all over the lid or on lower lash line. I wanted a good range in this palette, and this is the deepest warm shimmer we have to offer. Roxanne: I named this after myself (my middle name is Roxanne). That may be narcissistic, but I don’t care. My subscribers know this is my favorite color in the world. I honestly use it every day on lower lash line or outer crease. Jacz: An actual burgundy with great color payoff. 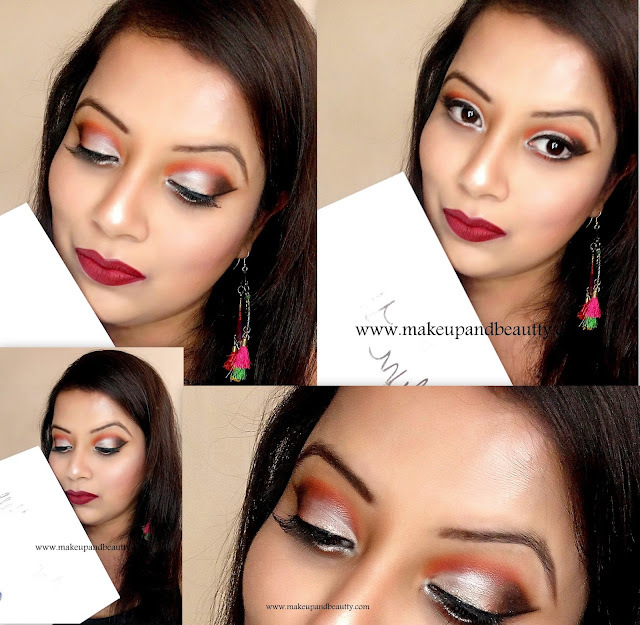 These high-pigmented mattes go through lots of rounds to make them this super creamy. Buns: This is Linda’s favorite crease color, but it took some time for it to grow on me. We removed it from the palette at least 5 times. I hated it at first, but now…obsessed. It’s a great everyday neutral shade for all skin tones. Cranapple: A true cranberry shade perfect for all over the lid. Royalty: I love it so much. The purplest of purples. A badass purple. No undertones. Just shimmery purple (I had to create one) that’s great to layer. Twerk: The reason this color is in the palette? I hate blue. I wanted to be able to wear an awesome shade of blue and this is it. Bold, fun and totally wearable with major wow factor. Hustle: For those of you not into warm shades, this is 100% cool with gunmetal, purple undertones. Meeks: The best bronze out there (and named after one of my best friends, because that girl loves her bronze). Not too metallic, and all ages can rock it whether you’re 14 or 40. 24/7: Completely different formula than the rest of the palette: pressed glitter, baby. Apply with finger, or a very wet brush, for a sophisticated, fresh-from-the-runway look. Chip: I use this shade all the time to smoke out outer corner and lower lash line. Creamy, smooth and highly pigmented. Win, win, win. Mocha: SO chocolatey and super warm, perfect for deepening any eye look. Pool Party: My favorite pop of color ever! Beautiful turquoise with flecks of glitter may seem over the top, but it’s not. It’s super wearable (just like a swimsuit). Jada: Named after my niece since this is her fave color in the whole world. Very similar to Pool Party, but with a matte spin. Diva: Bye-bye Christmassy green shades. I so wanted green in this palette, but a neutral one to wear all over lids and layer with warm reds…and not make you think of Santa. Enchanted: This deep, matte green is Diva’s (and all the other green shades) partner in crime. Central Park: I wanted every woman and man to have the option of a cool, matte brown. Soda Pop: We were so excited to get this color perfect. So deep and so dark. You almost think it’s black, but it’s purple. And one of the most complementary shades for any eye color. Abyss: Matte and black as hell. One of the blackest blacks I’ve seen. So hard to make black rock, but we did it. The palette comes in a beautiful white cardboard packaging for which it looks really classy and gorgeous. 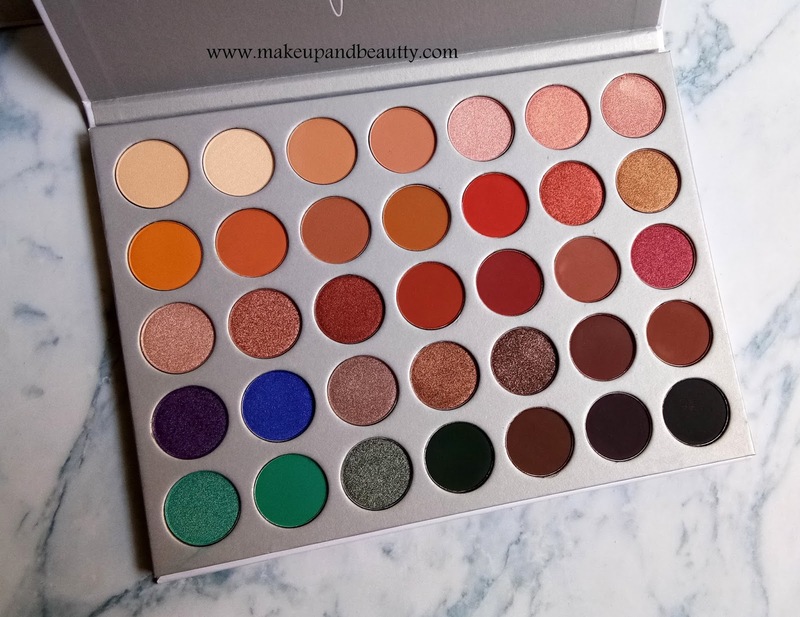 The name MORPHE X JACLYN HILL written in white metal kind of print on top of the palette. 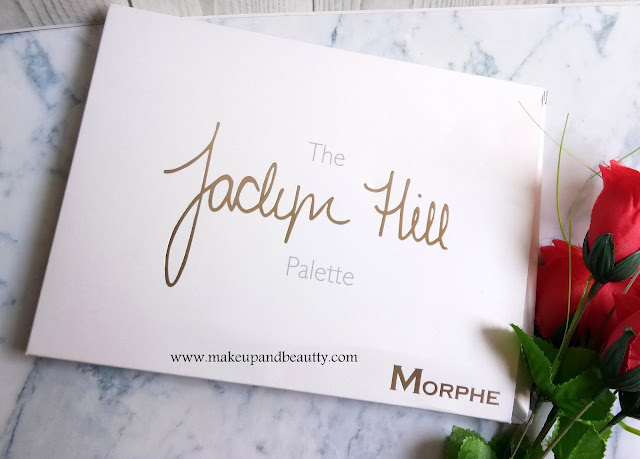 When you open the palette there is a sweet message written in it all from Jaclyn Hill to her followers. The palette has no mirror and no brush. The palette is huge in size but sleek in packaging. The palette comes in a white packaging for which I am really scared to handle it. As it might get dirty easily while applying eyeshadows. The eyeshadows are a mixture of matte and shimmers. The palette has mostly families of brown for which I can't say it is a versatile palette for all. But definitely, it is a "SAFE" (as the shades are pretty easy to work with to create any simple to gorgeous looks) palette for everyone. The matte shades are medium pigmented while shimmer works best with fingers and wet brushes. 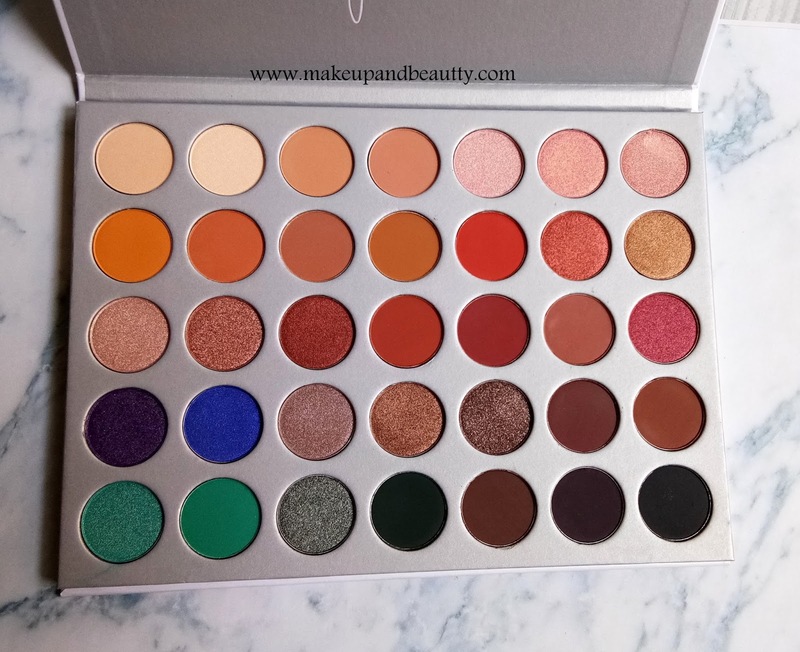 The texture of the eyeshadows in this palette is quite similar with the famous Morphe 350 (reviewed here) which is one of best selling palette of Morphe Brushes. The eyeshadows are pigmented and the texture is really smooth. Both the matte and shimmers are easily blendable on eyelids. There are minimal fallouts in few matte shades which are almost next to nothing. But the shades have no name in the palette for which whenever I had to refer a shade I had to look again and again to the shade card to read out the name. I wish the palette comes up with a brush and a mirror (when it is a limited edition, then there should be little difference in packaging) otherwise it is a down point to carry an extra mirror or brushes with it. 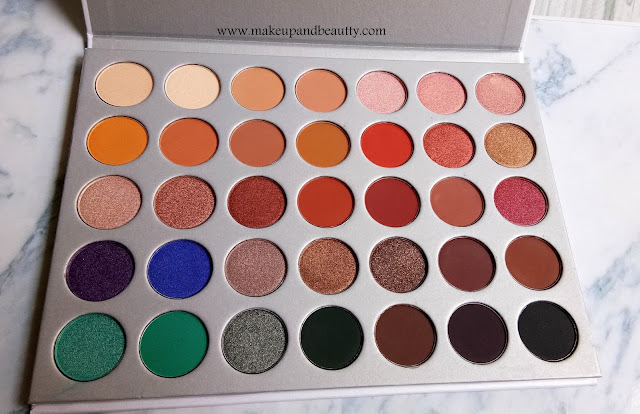 Overall it is a very decent palette which you can happily have it or skip it (trust me if you miss it then you will not gonna miss anything. 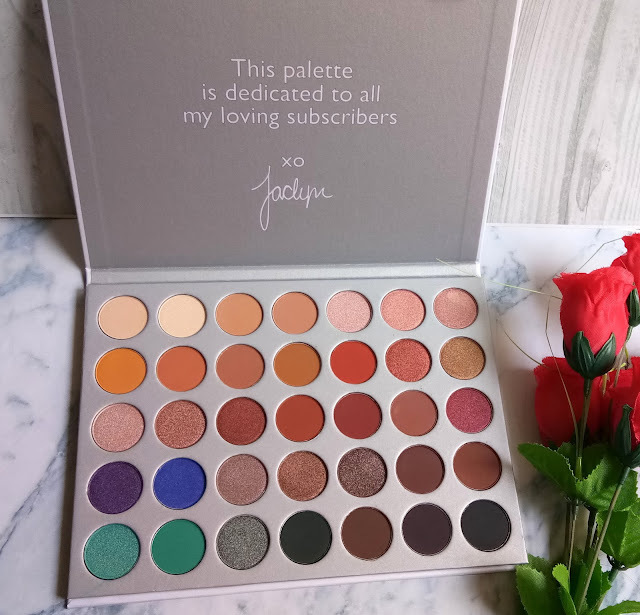 Moreover, as it is a collaboration with Jaclyn hill so the price of the palette is hefty when you add international shipping charges with it. An eye look is created using this eyeshadow palette only. So, that's all for today. I hope you like this post.